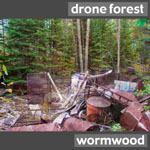 Wormwood, assembled by C. Reider, is the first release by Drone Forest in 2007. These drones could be the noisiest, most thorny and distorted thing Drone Forest has done to date. A tense journey. Click here to download all tracks and cover art, 320 kbps mp3. 148MB.